COLOR(S):White, cream, champagne, black, silver, black and tan, blue, gold, chocolate, parti-color and tri-colored. They can have solid or broad markings of any of these colors. The Havanese gives a rugged impression of a little dog, it is sturdy, and while a small breed, it is neither fragile nor overdone. This breed is related to the Bichon Frise. It is a happy, outgoing small dog; its temperament and trainability have made it an excellent candidate for obedience training. The Havanese is a natural companion dog: gentle and responsive. This dog can be quite vocal, as it loves the sound of its own voice. 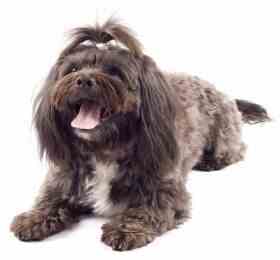 The Havanese is a very affectionate and playful dog with a high degree of intelligence. It is easy to obedience train; cheerful, very sociable and will get along with everyone including people, dogs, cats and other pets. It makes an excellent companion to children. This breed becomes very attached to its human family. The Havanese lives for your every word and gesture. This breed has a long reputation of being a circus dog, probably because it learns quickly and enjoys doing things for people. This is curious dog, it cannot miss what is going on around it, and so you may find your dog sitting somewhere high. It is very sensitive to the tone of your voice; harsh words will only upset the dog and will achieve very little. Few tend to bark a lot; it is best to teach your dog not to bark unnecessarily while it is still young to prevent it from becoming a habit. It makes an excellent watchdog, though some dogs may exhibit a degree of shyness around strangers, but this is not characteristic of the breed. It should be neither timid nor aggressive; it shows no cowardice, in spite of its size. This playful little dog has an average demand for exercise. Juvenile cataracts. Other health concerns include PRA (Progressive Retinal Atrophy), chondrodysplasia, deafness, hip dysplasia, liver shunts, luxating patellas, and skin conditions. Havanese require minimal exercise, making play sessions an easy outlet for their energy. Havanese should be indoors with semi-constant companionship. They are not meant to be kept outside or left alone. The best owner for this breed would be an individual or family who can devote a lot of time to the Havanese, living in a city or suburban environment.